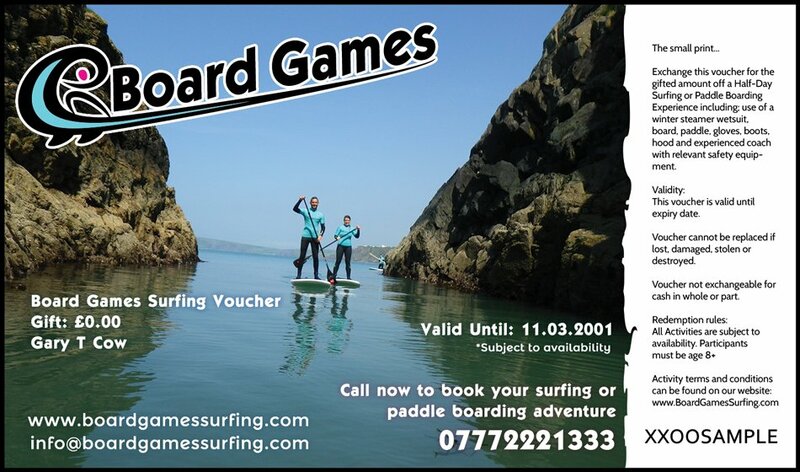 Looking for a gift vouchers that are a little bit different?… Board Games Surfing experience vouchers are ideal for children and adults alike. A cool present for birthdays, Christmas or a wedding anniversary! Our surfing and stand up paddle boarding gift vouchers are sent out via email for you to print and present or email on to the recipient. Vouchers are priced from £5 to £39, you choose how much you’d like to spend. If you are not sure what kind of board sport they want to have a go at, this is no problem as our vouchers cover all our activities. Both Surfing and Stand Up Paddle Boarding are half day activities, spending approx 2 hours in/on the water. Not only does the recipient get to choose their preferred activity, vouchers are valid for 12 months giving the recipient the flexibility to book a date of their choice. Subject to availability, please read our terms & conditions for more information. Name to appear on Voucher? Buy them an experience they won’t forget this Christmas, a Paddle Boarding tour along the Pembrokeshire coast national park. Family day out, childrens activity day, adult adventure weekends, corporate events, if you’re looking for things to do in Pembrokeshire Wales, join us for a Board Game!